IMPORTANT NOTE: Shopping on this website is conducted through Paypal's secure system. When clicking on a 'purchase' button or entering any personal information you will be taken to PayPal's fully secure pages. Paypal's basic shopping cart will rack up the postage excessively (especially in the UK). Don't worry! - purchases of two or more items will in most cases receive a combined shipping refund. Please see shipping page for more - maximum shipping charged within the UK mainland is £6.95 with most orders shipping for £2 - £4. Excess shipping will be manually refunded when the order is processed. 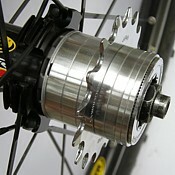 Allows road or mountain bike Shimano pattern cassette hubs to be used with a single cog. Pack of seven includes 1 of 7.5mm, 1 of 6.5mm, 1 of 5.5mm, 2 of 4.5mm and 2 of 2.5mm. Compared to the two wide spacers supplied in basic SS kits, this combination of seven spacers in five different narrow widths allows very precise fine tuning of rear chainline. Works with any SS cog (14t or larger) from the thinest taken from a cassette to the fattest Surly. Use with single, dual, triple cog set-ups etc - this is a very adaptable kit. Simply add cog and lockring. 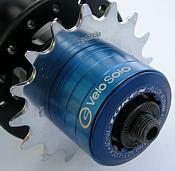 CNC custom machined in the UK exclusively for VeloSolo from solid lengths of 6082 aluminium alloy - not cut from tube. Thousands in use worldwide since 2007. Superb quality. Non-anodized and can thus be polished in a couple of minutes with Belgom Alu, Autosol, Peek etc (see last pic). Please see this page for sample weights of VS components. Please see FAQ for set-up advice and converting to singlespeed. 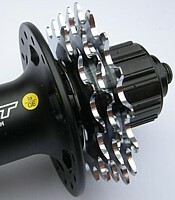 Note: kit is designed for virtually all 7/8/9/10/11 speed hubs and will fit over 99% of hubs. IMPORTANT: newer 11 speed (Hope Pro 4 etc) hubs (and rarely some 10 speed road hubs) have a wider freehub for the wider 11 speed cassette and an additional 2.5mm spacer may be required *IF* using a narrow 2mm single cog (this spacer often comes with the hub itself). We can supply this at minimal extra cost (contact us for details or request at time of order). If using a wider 4mm single cog (Andel, Surly etc) this will not be needed. Our kit is NOT compatible with certain DURA ACE hubs (7800 etc). Exact same CNC machined kit as above in five different widths - includes 1 of 7.5mm, 1 of 6.5mm, 1 of 5.5mm, 2 of 4.5mm and 2 of 2.5mm but anodized in custom colours with largest spacer laser etched. 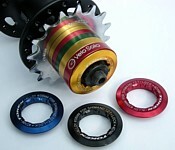 Choose from black, red, blue, gold, green, 'metallic' orange or special edition 'Rasta' mix of red, gold and green spacers. 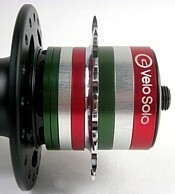 Perfect to match up with Chris King or Salsa parts. Two new colours 'Magnesium Bronze'** and 'Titanium Blue/Grey' now in stock. 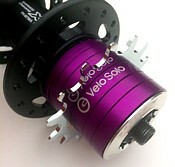 New anodized silver option now available as well as Retro Purple (see listing below to order). Please note: cogs, Token lockrings etc not included. Add a Token CNC 12t lockring and Andel SS cog for a complete top-spec singlespeed conversion kit ready to fit to any Shimano pattern cassette hub. See listing below for 'random mix' and custom spacers at special price (12.95 while stocks last) now available. Machined and anodized kit as above but in our 'Patriot' mix of red, white (silver) and blue. Perfect to match with your CK Patriot headset. Ideal too for those riders out there who want to fly the old red/white/blue flag - the UK, US, France, Australia, New Zealand, the Czech Republic, Iceland, the Netherlands, Luxembourg, Russia, Slovenia, Taiwan, Thailand, Cuba etc! Please note: cogs, Token lockrings etc not included. New colours now available include Italian red/white/green (white=silver) and black/gold/red that can be configured as Belgium or Germany. Also new in retro Purple. Limited number of 'random mix' spacers at special price (£12.95 while stocks last) now available. Each kit is the same spec as the other kits but in a random mix of assorted colours. Where possible we can custom assemble these to your choice of colour mix. IMPORTANT: not all combinations are possible but we will help where we can! Please send note with order. If no note is received a random mix will be sent. This is our five piece spacer kit normally sold for use with bottom brackets but it is also useful as a 'top up' kit in addition to a normal singlespeed spacer kit. Also suitable for spacing freewheels or track cogs. Manufactured as per our full kits above, this is ideal to replace lost spacers or to provide additional spacers to fine tune your conversion. Pack of five includes three of 2.5mm and two of 1.0mm. Exact same machined spacer kit as above but now available with new anodized finish. Four colours available - red, gold, blue or black. CNC custom machined in the UK from solid lengths of 6082 aluminium alloy. Pack of five includes three of 2.5mm and two of 1.0mm. As with the Andel track cogs these are identical in manufacture to S*RLY singlespeed cogs but do not have 'S*rly' engraved and you don't get a brown header card. The same superb quality machining in heat-treated cro-mo with a wide base of 4.35mm for full support on the freehub body, especially when used with aluminium freehubs. This specific width allows these to be combined and used with 9 speed shifters too for custom set-ups (ie 2, 3, 4 speed etc). Use with a road or mountain bike if running a splined Shimano pattern cassette hub as a singlespeed with our kits above or similar. Ideal for the 'free' side of a mountain bike fixed/free 'flip/flop' hub. Please see FAQ for set-up advice and converting to singlespeed. Width is 3/32" so usable with any 3/32" (8 or 9 speed) or 1/8" chain. Full height teeth with no ramps and beautiful polished chrome finish. Available in sizes 14t to 21t. Latest stock does not have Andel engraved. Please see FAQ for set-up advice and converting to singlespeed. 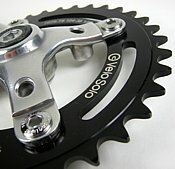 Excellent quality non-ramped cog for your singlespeed conversion. Use with a road or mountain bike if running a splined Shimano pattern cassette hub as a singlespeed with our kits above or similar. Ideal for the 'free' side of a mountain bike fixed/free 'flip/flop' hub. Please see FAQ for set-up advice and converting to singlespeed. Available in 3/32" (works fine with 1/8") with chrome finish. NOTE: current stock is not carded but supplied in plain polybag. Available in 14t, 16t or 18t. The 14t is great for singlespeed road conversions needing a higher gear. 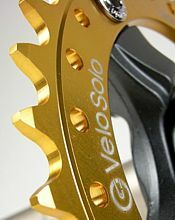 As with our road rings the VeloSolo mountain bike chainrings are precision machined from the same heat treated high strength 4.0mm thick 7075-T6 aluminium alloy for extra strength. No offset so reversible without affecting chainline for longer life. Very stiff and very strong. Teeth are hobbed the old fashioned way for superb finish and performance. Available in tooth counts of 32t, 34t and 36t. Two new larger sizes now in stock in 38t and 42t, perfect for faster road or downhill use. Classic style with machined cut-outs on 34t, 36t and 38t. The 32t is drilled rather than 'slotted'. The 42t has circular 'telephone dial' cut-outs. Minimal lead chamfer and full height teeth with no cut-outs or 'shift pins' give perfect engagement with the chain. Designed for singlespeed mountain bike use; on or off-road. Available in 4 bolt 104mm BCD and 1/8" or 3/32" thicknesses. Choose 1/8" with matching 1/8" chain for a superb long lasting and strong set-up for typical UK off-road conditions (the 1/8" width has nearly 50% more contact area for driving the chain than the 3/32"). Finished in anodized black or gold. New silver anodized also now available in all options. All with laser engraved logo. Please see this page for sample weights of VS components. Please see FAQ for chainring bolt advice and how to measure BCD etc. IMPORTANT - GOLD is now being phased out - once the existing stock of gold have been sold we will discontinue this colour. The current options now left in gold are: 1/8" 36t, 38t and 42t and in 3/32" 32t, 34t, 36t, 38t and 42t. 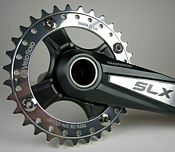 All 3/32" chainrings are 8/9/10 speed compatible and can be used singly or with a 1 x 8, 1 x 9 or 1 x 10 set-up. Exact same chainrings as above but in custom polished finish. High quality full polishing to both sides including inside cut-outs etc. Same laser engraved logos as above. Please note that traditionally polished items may tarnish over time due to weather, normal use etc and may require cleaning or re-polishing - we recommend 'Peek' (easily found on eBay). Please see our samples sale for some lower priced MTB polished rings. Note: now sold out and discontinued, anodized rings now available in silver to replace polished. Similar to our other chainrings but specifically in a smaller range of sizes for Campagnolo chainsets. Previously in 39t only we now have a larger 42t also available. BCD is 135mm. Width is 3/32" and machined down to 1.9mm so compatible with any 3/32" chain for singlespeed or as part of a 1 x 8, 1 x 9, 1 x 10 set-up. Still made from the same 4.0mm thick 7075-T6 aircraft grade aluminium alloy. No offset and non-countersunk bolt holes (some cranks may require double chainring bolts rather than single) so reversible without affecting chainline for longer life. Perfect for road use when paired with a 14t, 15t or 16t rear cog or for those who love Campag on their SS MTB a 39t front and 19t on the rear gives the ideal offroad ratio with lots of chain wrap. Minimal lead chamfer and full height teeth with no cut-outs or 'shift pins'. 25 lightening holes, weight approximately 65g (39t). Available in anodized black, silver and new green. Gebhardt Singlespeed MTB or Road 3/32" 104mm BCD Chainring - many new sizes now in stock! Ideal for converting a MTB to singlespeed or to replace a worn middle chainring, ideal match with a DX rear cog or 1 x 9, 1 x 10, 1 x 11 etc. Use off-road or on-road. High quality machined Dural aluminium ring made in Europe with full height teeth with no cut-away areas. Many larger sizes now available to include 32t, 34t, 36t, 38t, 40t, 42t, 44t, 46t, 48t & 50t. The standard ratio for off-road singlespeeding is 2:1 so use with a 16t (32) or 18t (36) or maybe a 14t with the 36 or 40t or larger for a faster gear when mainly on-road. All anodized silver, additionally many now available in black too. BCD is 104mm to fit most Shimano 4 bolt pattern chainsets (please measure the distance between the centre of two adjacent holes and the measurement should be 73.5mm). Compatible with all 3/32" chains. We often get asked for a singlespeed chainset usable with an MTB or maybe hybrid frame (all our other chainsets are really designed for narrow chainstay road/track frames) so we now have this Lasco model in our range. It's a strong no-nonsense build and ideal for use on or off-road. Arm length is 170mm or 175mm with polished finish and black CNC chain/bash guard. Crank bolts included. Chainring is a substantial 36t 3/32" usable with any chain from singlespeed 3/32" and 1/8" to 3/32" 8/9/10 speed so this can also be used as part of a 1 x 9 speed drivetrain or similar. BCD is 104mm so easily swapped with any standard MTB chainring. An 18t rear cog will give the standard off-road ratio of 2:1. See the FAQ for more advice on ratios. This is a very adaptable chainset, the chainring and guard can be swapped round or you could even convert this to a double chainset. 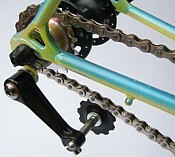 Moving the chainring from the middle to outer position will increase chainline by approximately 8mm. As usual at VeloSolo we are sticking with square taper fittings as they are tried and trusted, easy to fit and most importantly allow easy adjustment of chainline by varying the BB length to suit the desired set-up. Chainline required will depend on individual set-up but as a guide a 115mm Tange BB will give an approximate 50mm chainline, a 122 mm BB approx 54mm etc. You can of couse fit any length to suit a narrower/wider chainline but make sure the frame has proper clearance. See FAQ for more advice or email if you are unsure. Note: special order item - there will be a delay between purchase and dispatch. Token 6061-T6 Lockring for Cassette or Singlespeed Kits - all Shimano options back in stock! If you are converting a geared bike to singlespeed and you do not have a 12t lockring available from an old cassette or floating about in your spares box then this is what you need. Similar to Shimano lockrings but machined from heat treated high strength 6061-T6 aluminium.alloy. Weight approx 7g. Anodized and laser etched. Superb finishing touch to a singlespeed (or geared) build. 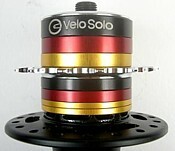 Looks great with VeloSolo singlespeed spacer kits. Available in black, silver, gold, red or blue and two slightly different sizes. 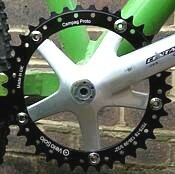 Choose 12t ring for singlespeed conversions with our spacers or when using a 12t small cog cassette on geared bikes. 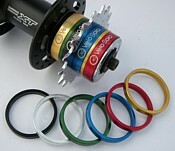 Choose 11t ring for use with an 11t cassette on a geared bike (11t lockring is NOT suitable for singlespeed spacers). Note: Token have slightly changed the engraving and style of these - please see first two pictures after clicking on link. At present we have a mix of both styles depending on option selected. Exact same CNC lockrings as above but now available to fit Campagnolo road bike cassettes. Again, choice of two sizes for cassettes with either an 11t or 12t smallest cog. Note: we often get asked if our SS spacers are compatible with Campag hubs - they are not designed for Campag but most riders have used them successfully. Unlike Shimano, Campag have changed freehub OD dimensions over the years, the ID of our spacers is 35mm so please measure your hub with a vernier guage if unsure. Photos show Shimano type mainly in use as a singlespeed lockring - Campag identical in looks except for engraving. These lockrings are of course originally intended for use with a regular geared bike cassette. Ideal for those who prefer a steel (Shimano type) lockring to the Token aluminium model above. 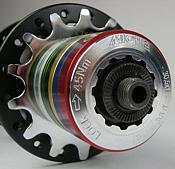 Compatable with any Shimano pattern cassette hub and for use with singlespeed spacer kits or 12t cassettes. Nickel finish* steel, secure with YC126 tool or similar. If you are converting a geared bike with vertical drop-outs to a singlespeed you will need a singlespeed tensioner to tension the chain (see link to FAQ below). These particular tensioners are well engineered, superb value for money and simple to fit in place of your normal rear mech. Main body of forged aluminium alloy. Floating jockey wheel with fully adjustable stainless steel arm for perfect chainline set-up. Built-in metal loop chain guide. These are sprung to tension chain downwards like a rear mech. We can modify them so that they can be used to push upwards but without being sprung* (easy to change back too if required). This is free of charge - just ask when ordering. Suitable for road or off-road use with 3/32" chain. Usable with 1/8" chain but may require removal of chainguide. See FAQ for much more tensioner advice. Note: If you are unfamiliar with chain tensioners and to avoid damage please see the FAQ for set-up and installation advice before fitting one. This is a screw on freewheel for traditional threaded hubs, ideal to convert an older road wheel with multi-speed freewheel to a singlespeed. 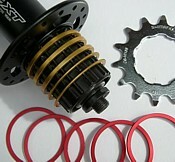 Also perfect for use with modern threaded singlespeed hubs for road, off-road or BMX. Not suitable for splined cassette hubs. Usual reliable Shimano high quality in high strength chro-moly steel. Available in 16, 17 or 18 teeth and suitable for 3/32" or 1/8" chains. We have sold many thousands of these over the years and they have proved superbly reliable and fantastic value. Removal tool available from tool section of shop or below. As Shimano continue to increase both their trade and retail prices we offer a more economical alternative to the freewheel above. Excellent quality model from Dicta, available in 16, 17 or 18 teeth and specific models for 3/32" or 1/8" chains. Chrome finish. 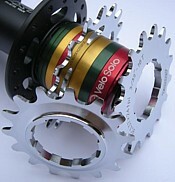 Also perfect for use with modern threaded singlespeed hubs for road, off-road or BMX. Not suitable for splined cassette hubs. These are used in conjuction with an adjustable wrench or 24mm spanner. Good quality forged construction for frequent and reliable use. Four prong design for removing Dicta freewheels. With a little care this will also remove Shimano freewheels (to replace FR-6 type tool). Paypal's basic shopping cart does not calculate international shipping (please see the shipping page for full details before ordering). If buying from outside the UK please add the extra shipping required via these 'shipping units'. For example, a cog costs £15.95 and UK shipping at £2.50 will be included. For delivery to the EU shipping is £4.50 (£2.00 extra) so if you purchase a cog from Europe you will also need to purchase 1 x £2.00 shipping units. Other charges may apply depending on the destination, again please see the shipping page for full details. If you are unsure simply place the order as required and we will advise of any additional shipping costs necessary. Alternatively, if you would like an exact quote for shipping or a detailed Paypal invoice before making a purchase please email and we will be happy to help.